What Does Such A Warm Winter Mean For Farmers? Everybody knows that agriculture heavily relies on the weather. A single storm can change an entire growing season. A drought can be devastating. But we rarely see such extremes. While much of the weather we get can be challenging and surprising, it typically averages out over time. This winter, though, has been a particularly weird one- right? I’m not going to go into the details of the weather of this winter. Suffice to say, we moved snow once this winter, and you could probably make the case that we just really wanted to run the dozer tractor. This has been a winter with very limited snow and very mild temperatures. We had a couple weeks of extreme cold in January, but realistically this has been one easy winter. February was so warm that we lost what little snow we had before March even started. That is a rare situation. 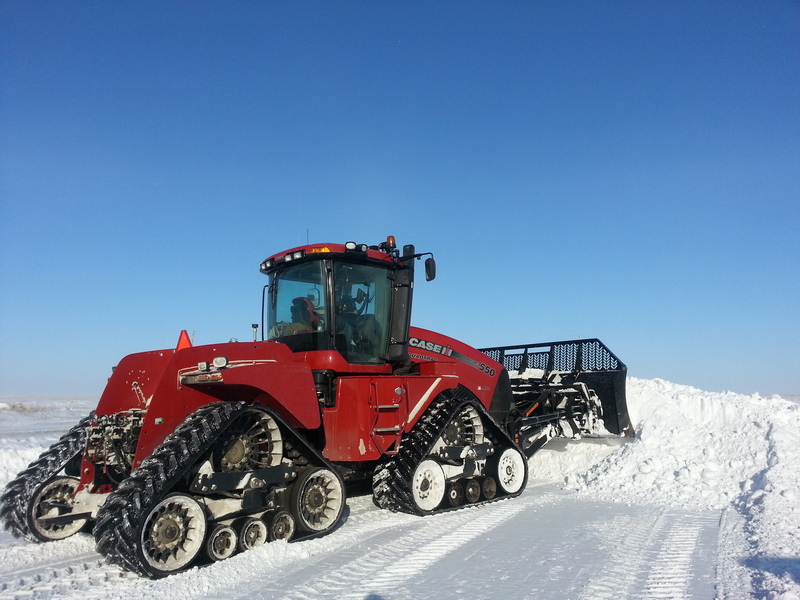 Seriously, it’s hard not to have fun moving snow with this thing. So what are the implications of this? Are we headed for a drought? Is it climate change? Has this ever happened before? To point out how short our own memories often are, take a look at this picture from 2012. This is February 22nd (photo credit- Sarah Leguee). No snow! That was also an incredibly mild winter. In fact, some farmers in Southeast Saskatchewan started seeding at the beginning of April (spoiler alert: it didn’t turn out very well). My point is that winters like this are certainly rare, but not unheard of. To figure out what a winter like this could mean for us, the best year to look at then is 2012. In this area, crops were good, and it was a pretty successful year. We saw excessive moisture in late May and June, followed by a lack of moisture into the end of July and August. The excess moisture in the spring caused some damage, but it probably saved us from getting burned up in late summer. On the other hand, we had substantial disease and insect pressure. Was it because of the warm winter? I think it’s fair to say that it had an influence, possibly a major one. One thing our extreme winters give us is an inability for insects and diseases to overwinter here. Most of them must migrate up from the south. If they can survive the winter, it gives them a head start. We saw severe damage from Aster Yellows, we had trouble with Fusarium, and we had problems with a variety of insects. Separating what was caused by the warm winter and what was part of a normal cycle is difficult, but it is fair to say that we could face similar issues in 2016. The challenge with farming is that every year is different. Parallels between seasons are very challenging to draw out, and due to the climate’s chaotic nature, forecasters have a very hard time forecasting what is to come. So what can we expect in 2016? One thing we do know right now is that it is dry. Soil moisture is lower now than it was at this time last year, so we have less of a buffer to withstand periods of low moisture. This warm, dry winter has not helped our soils and water bodies recharge like they normally do. I have never scouted crops in the middle of March before, but I did just that the other day in our winter wheat. 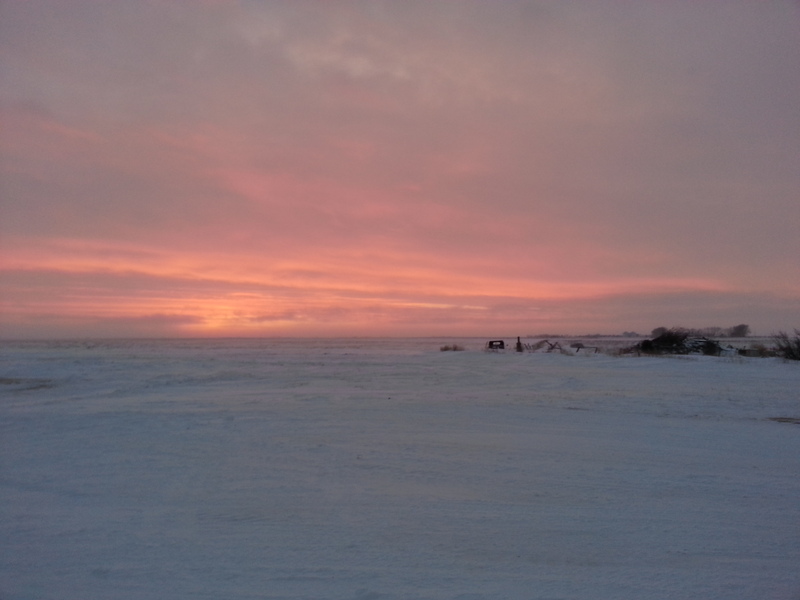 The soil is thawed, the crop may be breaking its winter dormancy, and it just pretty much felt like spring out there. It is concerningly early for the wheat to be greening up, and a stretch of more normal cold weather could wreak havoc on it. This picture could very easily be from the end of May, but it is actually from March 14th. As the weeks go by and it stays warm, sunny and frequently windy, the soil will continue to dry. We could theoretically start seeding in a couple of weeks (we won’t) with how quickly the soil is drying up. So, yes, drought is a concern, and the longer the weather stays like this, the greater the worry will become. On the flip side, when the weather does change, it could do so with a vengeance. We have seen time and again over the past several years that when we change weather patterns, the conversion is often harsh. 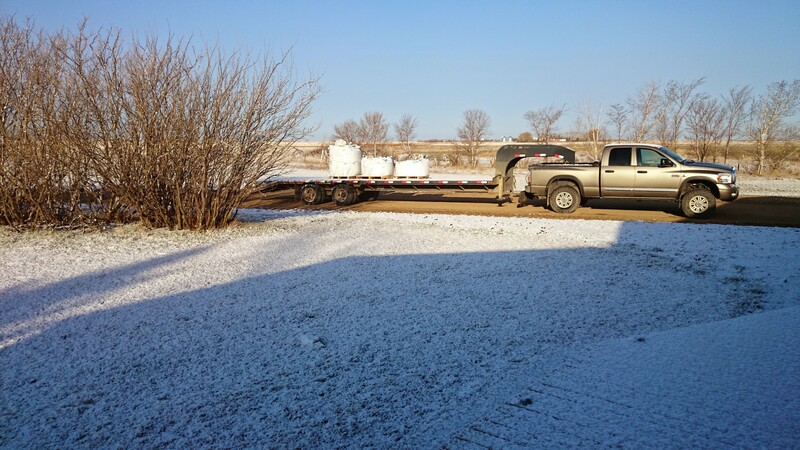 In the spring of 2011, we were considering seeding in mid to late April, until a bunch of snow dropped on our doorstep, followed by cold temperatures and over a foot of rain over the next two months. The weather changed dramatically and pretty much prevented seeding altogether. However, our fields were already full to capacity when that moisture came, so it was a completely different situation. I guess the point of what I’m trying to say here is that we honestly really don’t know what the growing season will provide. Right now, I’d place my bets on being dry, and that we will be wanting for rain most of the year. But “dry” doesn’t equal “drought”, and I’m far from ready to hit the panic button yet. While this weather may be unusual, we have seen winters like this before, and we will again. As farmers, we have to take whatever nature throws at us and make the best of it. We never know what weather we have in front of us, and accordingly we have a hard time determining how much to invest in our crops. We can throw all the money in the world at our crops, but if it doesn’t rain, we simply can’t make use of it. However, it is far too early to start worrying about the year ahead. We will not go out and go seeding on the 10th of April, but we might be a few days earlier than normal. Anything can happen over the next 6 months, and that is what makes agriculture so exciting. I can’t wait to see what Mother Nature has in store for us in 2016. Ever since I became involved in the farm, seeding has been an endurance test. You push every hour of every day in the fight against time to try and hammer a crop in the ground. If you delay, if you hold back, you will regret it – and the farm will suffer for it. Every spring since 2009 has been wet, cold and generally hostile to planting quickly and properly. 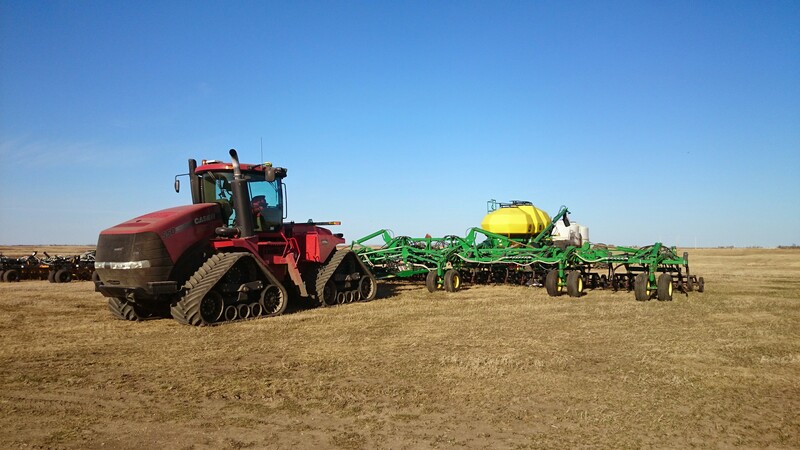 The key to surviving these years has been to have a lot of equipment, a lot of people, and simplified crop plans to try and plant as quickly and efficiently as possible. 2015 could not be more different. Spring so far has been warm, dry and generally pretty pleasant. Sure, there has been cold, and no shortage of wind (surprise, surprise), but this spring has been very conducive to quick planting. We started seeding on one of our earliest dates ever, April 23rd, and have now seeded two thirds of our crop (that does include winter wheat). To be this far into seeding this early is unprecedented in my father’s career. Previous years have certainly changed our planting model. 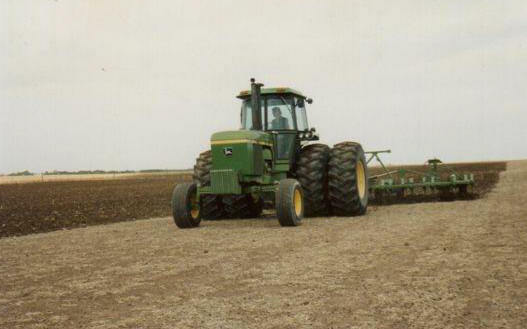 When I started becoming involved with the farm back in the late 2000’s, we had one 60 foot-wide air drill to seed over 9,000 acres. We ran it hard and only stopped for a few hours during the night, and since it was drier then, we could quite reasonably do that with low risk of problems. Now, we have more than doubled our drill size and only moderately expanded our acres to seed. Any day that we can possibly consider seeding, we go, and we go hard. Not being ready or having mechanical breakdowns is not an option. We have been groomed to plant a crop as quickly as possible, and any mistakes we make, rain can be counted on to fix. While we still have a great deal of moisture saved up in our soil profile, and the sloughs are still very full, we are in a dry bias. We now have to consider making a paradigm shift in our entire seeding strategy; slowing down. If we plant too much too early, we run the risk of a frost crippling our crop. If we push too hard and make mistakes, we may not longer be able to count on a rain coming along to save us. Fertilizer placement and seeding depth are now critical issues; if we plant too shallow, and not hit moisture, we rely on rain coming along to get the crop germinated. What if it doesn’t rain for a few weeks? Sure, there is moisture underneath, but if that seed does not sense water around it, it simply will not start growing, and that subsoil moisture will be useless. On the other hand, if we plant too deep and it does rain hard, we run the risk of the crop not breaking through the surface and going into secondary dormancy. How do we make this choice? We don’t know what the weather will do. Our soil type is very prone to crusting, and if we seed our canola too deep, we could lose it; but if it doesn’t germinate due to dried-out topsoil, we can lose it that way too. Any mistakes we make, or the electronics or hydraulics make, can seriously bite us in the future when we can’t rely on a rain. 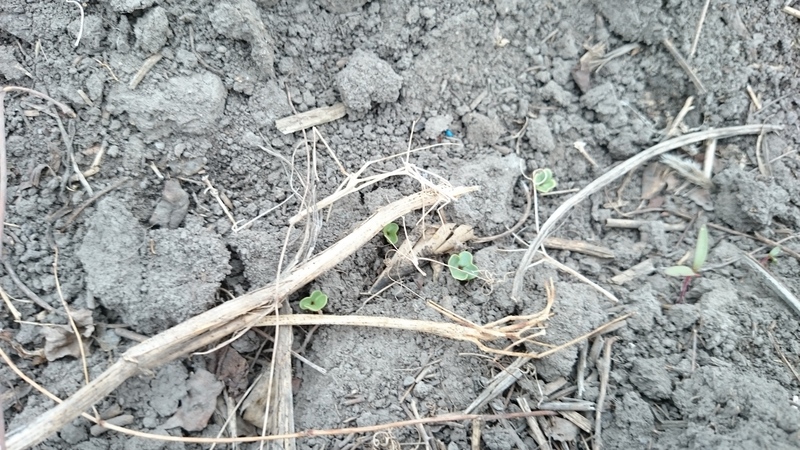 Cute little canola seedlings trying to get started in a dry seedbed. It’s an odd feeling to worry over dryness when all I have done over the past 6-7 years is worry over saturation. The reality is that any small rain will get the crop going, and once those roots hit that subsoil moisture, we will be in good shape. Yesterday we may have gotten that; depending on the field, we got anywhere from 4-7 millimeters of rain, which although is quite minor, may just be enough to get germination. What we need to do now is slow down and ensure everything we do is perfect. No mistakes can go on for long. When moisture is limited, you do whatever you can to conserve it and give your crop the best chance you can. Of course, this sounds good in principle. But after years of pushing yourself to the point of exhaustion every single day to endeavor to plant every acre you can, it is very difficult to shed that mindset. You don’t need to run ridiculous hours. You don’t need to try and plant the entire crop in a week and a half. However, you do need to do the job right. There is no job we do all year that is more important to do perfectly than this one. There are no second chances. Despite my concerns about the early calendar date and the drying topsoil, this is a wonderful change of pace from the last few years. The crops has been going into beautiful seedbed conditions, without being hammered by inches of rain every couple of weeks, with warm, cozy soil around them. We aren’t exhausted, seeding until midnight and starting again in the early hours of the morning, desperately trying to seed as many acres per day as humanly possible. As long as we get some timely rains, this is already shaping up to at least be a much less stressful year than we have seen in some time. We’ve had time to fix mechanical problems without pulling our hair out, we’ve had time to run some trials, and we’ve been able to check our work as we go – all very important components to proper seeding that have been avoided the past few years for lack of time to do them. The next month and a half will be critical to the success of this year’s planting endeavor. We may finish seeding in a week or so, but we will be nervously looking at the nighttime temperatures and topsoil moisture. Will we get enough to get the crop growing? And, if we do, will it survive a month that often brings with it some awfully cold nights? Whatever the case may be, I will say one thing: this drier, warmer spring? I think I like it. Right now, I am sitting in the cab of our Case tractor, hooked to our new Seed Master drill, where I have spent the past 10 hours. Normally, this would be just fine – but that would be if I were actually accomplishing something. Since 6:00 this morning, we have been fighting with this air drill, trying to get it working. The air drill is new this year, and it has been nothing but trouble so far. Let me give you a little bit of background. 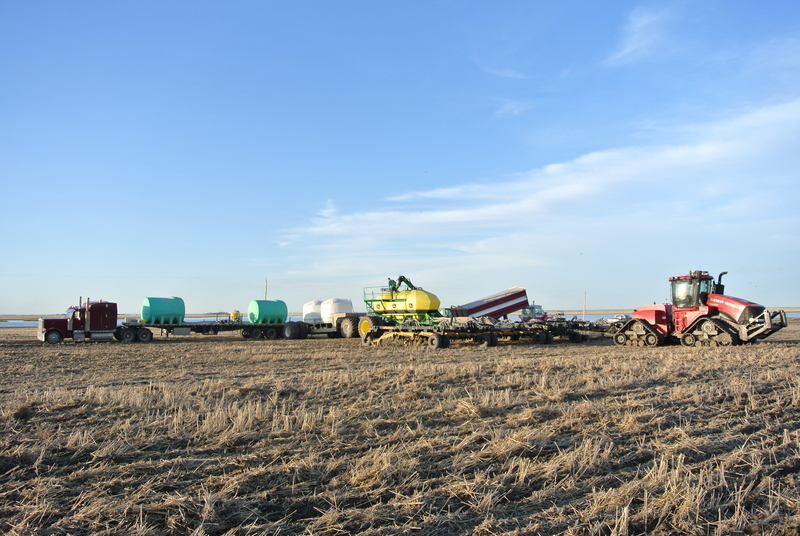 Last fall, we leased a new Seed Master air drill, hooked to a John Deere air cart, and seeded winter wheat. Everything went quite well with that, and we pulled it with one of our old John Deere 9400 tractors. Now, thinking we were being smart, we bought a Case tractor to pull the drill. “Hook a Case to a Deere cart,” they said. “It will be fun,” they said. Well, they were wrong. Connecting two different systems into one has been a serious headache. Complicating things further was the addition of the liquid fertilizer system to the drill, which we have run on our previous drills for quite a long time, but clearly added complication to this new system. Why did we buy a Case tractor instead of a John Deere? Well, Case builds a Quadtrac tractor, which has tracks to replace the tires on all four corners. Deere also offers a track tractor, but they are single tracks on each side, much like a big industrial Cat, which is hard to steer and much less versatile than the quad track design. But I’m not sure it was worth it! To make a long story short, I am sitting here with a $700,000 set of equipment doing nothing. It is supposed to rain tomorrow, and we are already late starting seeding as it is. Delays are not acceptable at this stage. I was expecting some troubles in getting this thing working, but not this much. Not even close. The worst part is, we still don’t know what the problem is! This is a nightmare. And it was. It would be another full day of work to get that air drill going. Sunday evening, it finally seemed as though we had worked through the issues, and the new SeedMaster was finally rolling. Two full days of delays had cost us, but it was still early. We could make up the time. Thankfully, it didn’t rain. The rest of the week was a blur, with only a few other major issues, such as a blown fertilizer pump on the new liquid wagon (still not really sure why, I only know that it cost us a half a day and $1,500 for a new pump) and only a couple of minor stucks. Despite the issues, in that week we seeded the Green Peas, the lentils, 40% of the durum, half the canola and some spring wheat. I’d say we did pretty well! The nice thing about having two large air drills is that when things go right, you can accomplish a lot in a day. We had a couple of 700+ acre days, and if there hadn’t been such a heavy dew this morning, we could have done that again today. Keeping up with these drills is a challenge, and the trucks are non-stop busy all day. 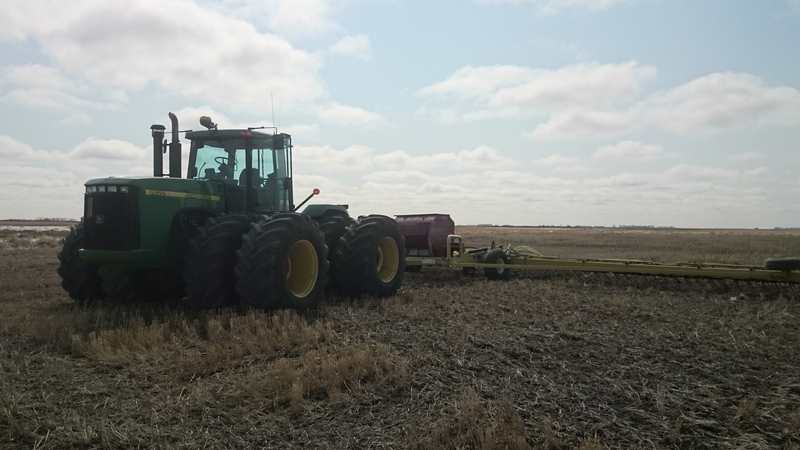 Hauling fertilizer and seed to the drills is a full-time job for two people, so our drill operators do tend to get stuck out in the field longer than they should. We are trying to address that by getting on a drill in the morning to get it going, but other jobs keep getting in the way! All the pea and lentil ground needs to be rolled to flatten the fields out (these crops grow very low to the ground, so the combine needs to be able to run its header on the ground without picking dirt), many fields need vertical tillage to clean up last year’s straw, and most important of all, the sprayer needs to stay ahead of the drills to kill weeds before the crop comes up. All of this can come together with organization and enough people to help. This weekend, my younger sister and her husband came out to help. We need all the people we can get to keep everything moving! Do We Really Need Chemicals to Control Weeds? With seeding only a mere two weeks away (ish), every farmer’s mind whirls a million miles a minute in a thousand different directions. Do I have all my seed? Did I order enough fertilizer? When will I get into the field? Is my equipment ready to go? What chemicals am I using? And this is only scratching the surface. 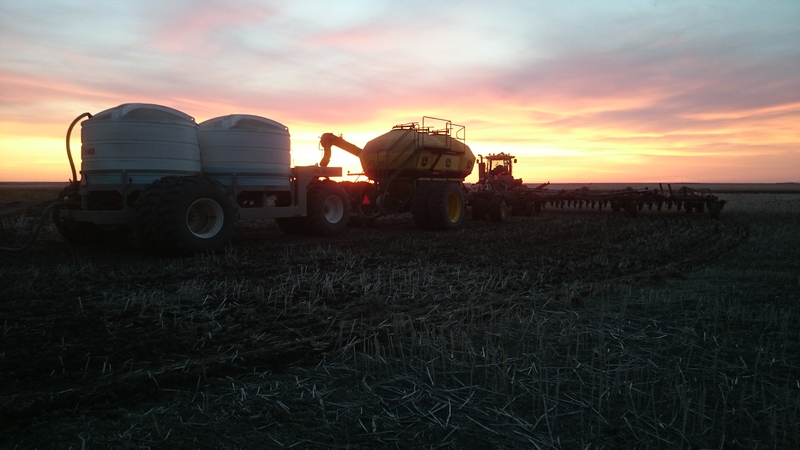 With seeding creeping up all too quickly, focusing on one thing at a time is vital to keeping your sanity and to ensuring you have all your bases covered. Right now, I’m concentrating on what may be the most important factor in the entire growing season: controlling weeds. That may sound a little boring, focusing on a task that has been done for thousands of years. 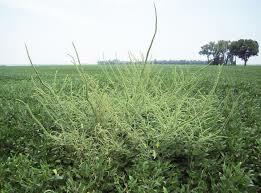 But if you cannot keep weeds under control, the crop will simply not be successful. Moreover, controlling weeds is a complicated and frustrating task. I will admit, when I first graduated from university in 2010, I thought weeds were easy. Just throw in some herbicides and take care of ’em! Since then, I have learned that nothing about weeds is simple. On our farm, we use herbicides as the primary tool in controlling weeds. Of course, other cultural practices are important, such as rotating crops so that no crop is planted in the same field two years in a row (3-4 years between is better), using good quality, clean seed that emerges vigorously, seeding as early as we can to give our crops a head start, ensuring the drill doesn’t have any misses or blocked rows to get the ground covered as quickly as possible, and growing competitive crops that crowd out the weeds wherever possible. Yet, the only reason these practices all work is because of the use of herbicides. Years ago, when my father was a child, farming was very different. Herbicides were more or less non-existent, except for the old standard: 2,4-D. However, it was so expensive to use that it was really only used for patch treatments to clean up problem areas. Instead of herbicides, the main source of weed control was tillage. Ripping the ground up and leaving it black was a summer-long job for many farmers, with half the farm in this “summerfallow” and half of it seeded to crops like wheat and barley. While this practice did work to control weeds, it was very hard on the soil, causing topsoil to erode from wind and water, and microorganisms in the soil struggled to survive. 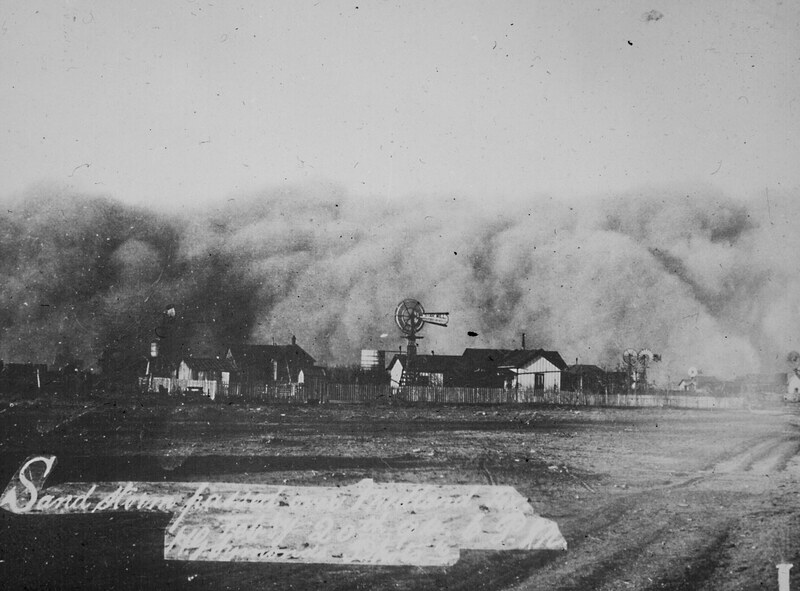 The famous “Dust Bowl” of the 1930’s was largely caused by tillage. But it was all they had to control weeds; without which, agriculture was doomed. Everything changed with the advent of glyphosate, or “Roundup”, in the 1970s. This broad-spectrum herbicide changed the world, with its ability to control dozens of weeds at relatively low doses. While it was initially used sparingly due to its high cost, as the price came down, farmers were finally able to move away from tillage and use chemicals to control weeds instead. but instead uses tillage. Please recognize that the advent of all of our herbicides in the 1980s and 1990s is the reason we are able to practice no-till, which has saved our soils in Western Canada. We rarely have to till at all anymore, which protects our fragile topsoil from the ravages of high winds and heavy rainfall. Is their a resource more precious on this Earth than our soil? Moreover, the herbicides we use are largely safe (yes, even 2,4-D) and, as long as used as directed, have never caused any known injury even to we farmers applying them. use. 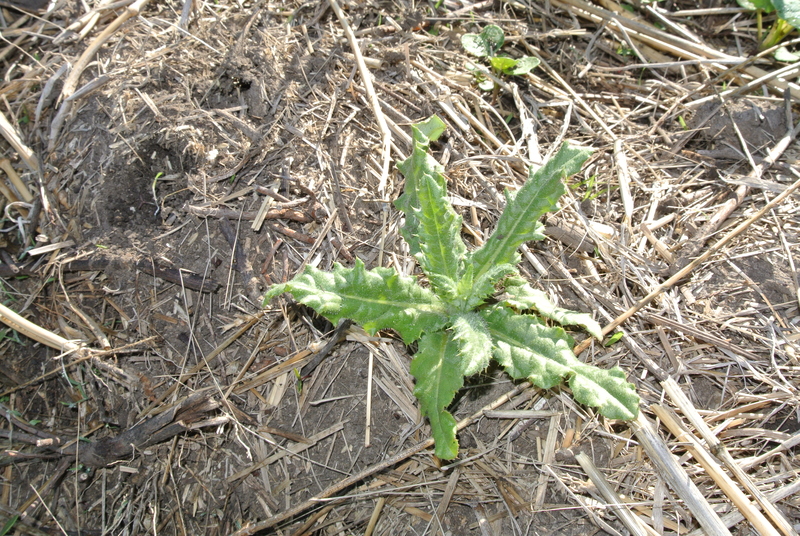 Another issue with herbicides that has cropped up in recent years is weeds’ ability to adapt to them. Unfortunately, many farmers choose to grow the same crops over and over again on the same field, using the same herbicides multiple times per year. A random weed just may happen to have a genetic mutation that allows it to survive the application. That weed survives, spreads its seeds, and grows to a larger population the next year. This can quickly spread over an entire field, or more, in just a few years. Glyphosate, one of the world’s greatest discoveries, has become ineffective in many areas because of this. Herbicide resistance isn’t the fault of the company that produces it. Sure, they could have done a better job of explaining to farmers the risk of overapplication. The onus, however, is on the farmer. It is his/her land and that farmer should have thought about the risk of growing the same cropping system over and over again. It is an unfortunate situation. 2,4-D is a Group 4, which basically causes the plant to grow itself to death. Grasses generally aren’t affected by it, so it can be used on crops like wheat and barley. Using this group over and over on the same field can result in the weeds adapting to it, so we rotate Group 4s with other groups, like Group 2, 6, 27 and some others. This takes careful management, but it is very effective. 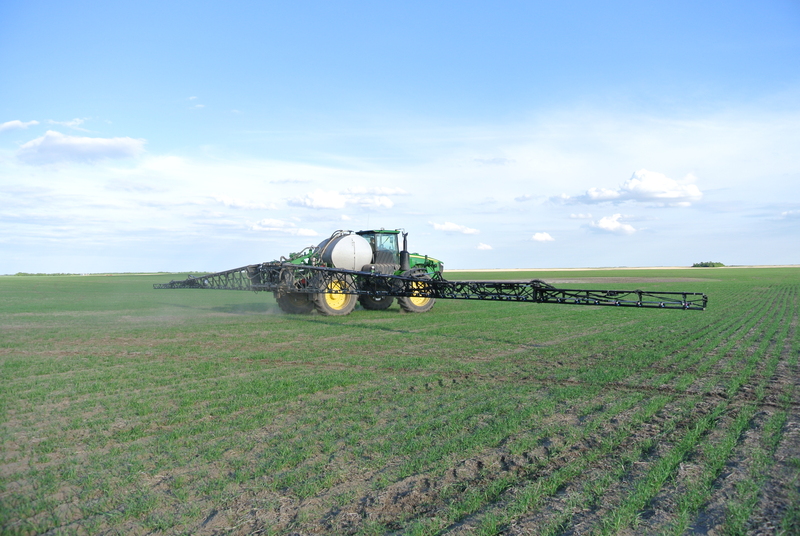 Some herbicides are sprayed on top of the crop, while some are sprayed on the soil before seeding, and still others are dry products mixed into the soil in the fall before seeding. All have their fit, and using the right mixture can kill the weeds your specific fields have difficulties with. Mother Nature has an incredible ability to adapt to whatever we throw at her, and controlling weeds is somewhat of a treadmill; every time we come up with a new way to kill them, they come up with a way to survive it. 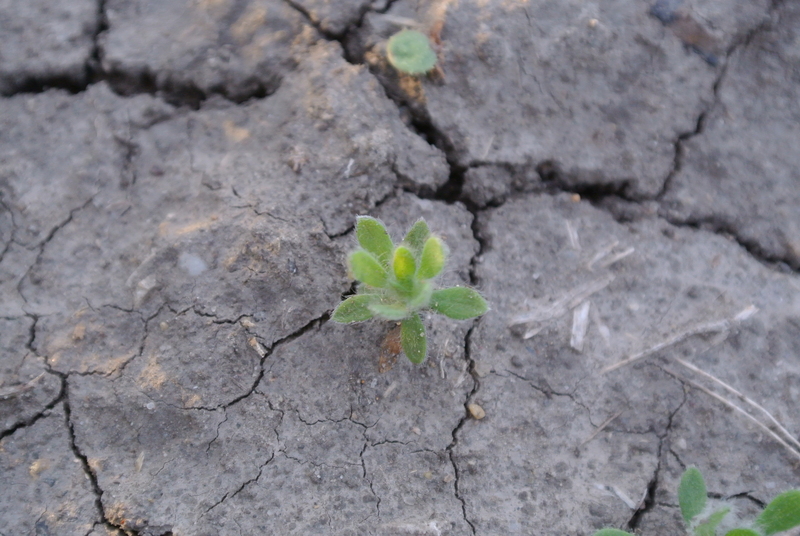 Frustratingly, they seem to slowly be winning the war, with herbicide resistance popping up more and more every year. So, every spring I go through the hundreds of different products that are out there to try and determine which ones I will use that year. As I learn more and more about weeds and herbicides, I learn better ways to control them, especially the ones that plague our area, like kochia, wild oats, foxtail barley, stinkweed, Canada thistle, wild buckwheat, and many, many others. Weeds are crafty plants that always seem to find a way to overcome every hurdle you throw at it; but if we challenge them every year with different crops, different herbicides, and different ideas, we can beat them. Agriculture is all about problem solving, and coming up with new and innovative ways to reinvent the wheel. Never stop thinking and never stop learning, and you just may have a shot at making a go of this thing we call farming. What do you think about herbicides? Should we be using them, or should we go back to tillage? Write your comments below! Is Winter’s Grip Finally Breaking? It was in early November that winter settled in. The days slowly turned colder and shorter, and the ground rather suddenly turned white with fresh-fallen snow. Fieldwork had been stopped, whether one was ready for it or not, and equipment was quickly tucked away for the winter months. The majestic season that is winter had arrived. That was over four months ago- four months of cold, snow, heavy clothes, cold vehicles and expensive energy bills. It has been one of the colder winters I can remember, with near record days below -30 degrees and precious few days of negative single digits. Nevertheless, as we reach the mid-point of March, we are finally seeing signs of winter failing. The Sun actually feels like it is creating heat now, and the days have grown longer, with sunlight persisting even after supper. And, finally, the snow has begun to recede under the glowing heat of the Sun. Yes, as winter begins to draw to a close, a glimmer of excitement begins to appear in people’s eyes. Conversely, we have just realized how much work we have left to do before spring break-up begins! After such a massive harvest, we had a lot of grain to move. And with the pathetically slow movement of it, due to incompetent railway management, we still have a lot to move. Our bins at home are still full, and consequently we still have grain bags out in the fields. You can imagine what happens to these long, plastic tubes when the ground starts to thaw. After being mauled by birds, raccoons and deer all winter, they are not in the best of shape anymore, with multiple holes and tears perforating them like Swiss cheese. As the snow melts and the fields turn to water and muck, the bags will not fare well, and we may lose some grain to spoilage. In short, it is time to get them emptied out. Out of the ~20 bags we had in the field after harvest, only six remain. One bag of soybeans, one of durum, and three of spring wheat are all that we have left. So, we began the arduous task of emptying the bags and moving them into bins. Why not to the grain companies? Because they are still full. What bins will we move it all to? Good question. Fortunately, we have close neighbors, and we therefore will be able to use some of their bins and a few of ours that aren’t still stuffed full. 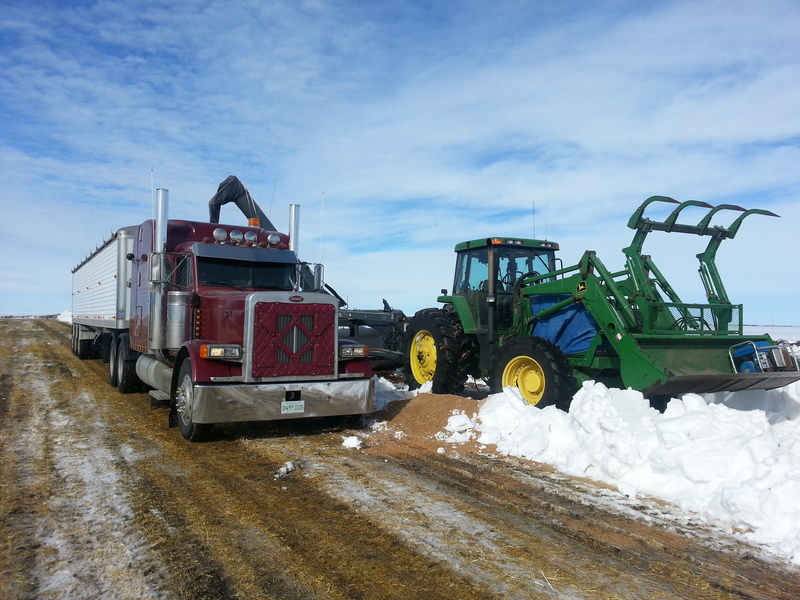 The snow-dozer tractor has been busy, cleaning out all around the bags and the back roads to get to them. On the weekend, we got the first bag cleaned out and moved home. Soybean bag: check! Fortunately or unfortunately, the weather has warmed up faster than was anticipated. A couple of days have already leaped above 5 degrees Celsius, which, especially if the sun is shining, can melt quite a lot of snow. The areas pushed out around the bags have quickly turned muddy, and the roads have become very wet and dirty. Our semi trucks are no longer clean! Over the past few days, we have gotten two more bags cleaned up. Only one bag of wheat and one of durum remain. The durum has nowhere to be moved to, and sadly must remain where it is for now. The only goal now is to get the final bag of wheat moved out. It is vital that it be moved out soon; it’s located in the back corner of a field that only dirt trails go to. The ground is low down there, and if we don’t get the bag out before spring arrives, we will be in trouble. 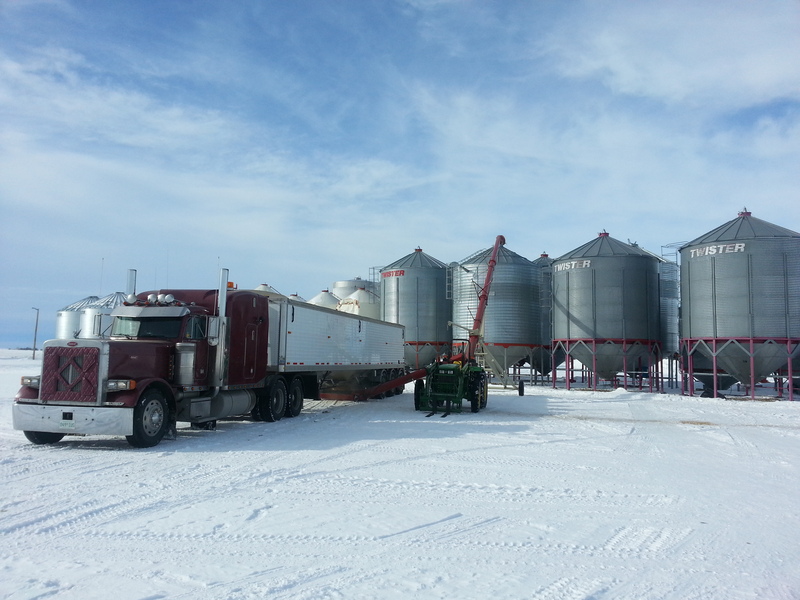 As we move further into these warmer days, it becomes more and more difficult to move grain. Limits are already in place as to how much weight can be loaded, and eventually no trucks will be allowed on the roads until the spring thaw has completed. Consequently, our days for hauling are becoming shorter and shorter. On the flip side of all of this is the excitement that comes with spring. Seeding is only a month and a half away, and much must be done before this occurs. 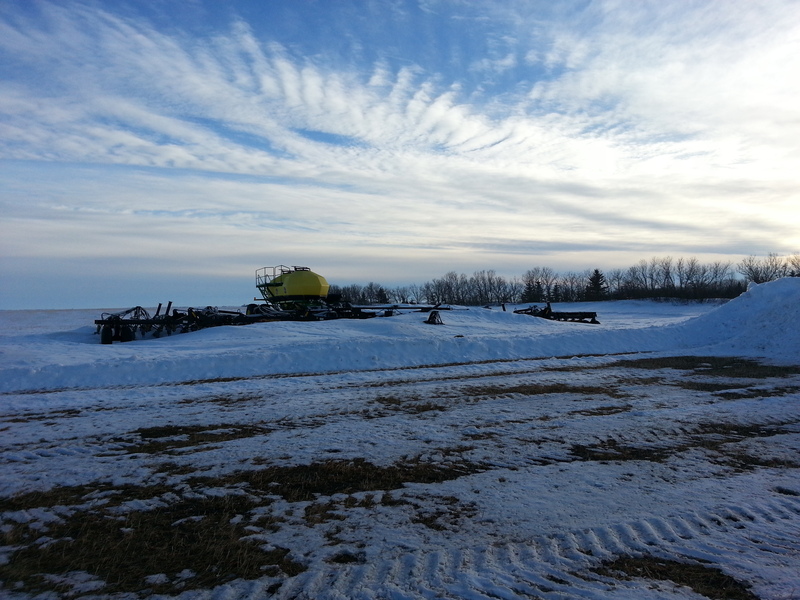 The air drills still sit entombed in snow, and one of them in particular will need significant work before seeding can begin. The sooner it melts out, the sooner we can get it ready. I should point out one other thing about the spring melt. Although a few warm days quickly settle a great deal of snow, it takes a great deal of time to melt the white fields. The sunlight reflects off of the snow, slowing the melting process. Sometimes, it can take a long time to draw down the snowpack enough to get black ground to show. Once that happens, the melting process really speeds up. So, the more melting that goes on in this current warm spell, the better off we will be. Notice I said, “current warm spell”? I have a feeling that winter isn’t done yet. It is rare in my experience that winter lets go so suddenly. No, Mother Nature doesn’t give up that easily. She will give us yet another blast of cold air yet, and maybe even more snow. Just a hunch, anyway. As we finish up the last of the grain bags, preparations will truly begin for spring. Excitement is brewing in all Canadians for the end of winter: but none more so than farmers, waiting to get another shot at growing the crop of their dreams. Light and dark, glowing warmth and bitter cold, death and rebirth. Winter, a time of cold, dark, and bare and empty trees and fields, is finally coming to a close. Spring, a time of rebirth, is coming. And I can’t wait.